The sentences bring to an end the biggest trial so far for rigging interest rates - in this case the Euribor benchmark used to fix the interest rates of millions of euro-denominated loans. Lisa Osofsky, director of the Serious Fraud Office, said: "These men deliberately undermined the integrity of the financial system to line their pockets and advance the interests of their employers. In the 1990s and 2000s, traders routinely requested that the submissions be tweaked up or down by tiny amounts to suit their banks' commercial interests. Banks typically had trading positions or investments that would benefit from higher or lower submissions. The traders' defence has been that this was normal commercial practice. The Serious Fraud Office (SFO) says it is corrupt. 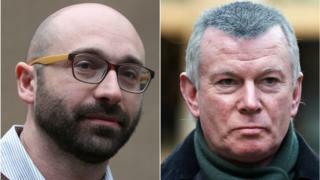 During the sentencing hearing, Judge Michael Gledhill echoed controversial remarks by Mr Justice Cooke, who presided over the first interest rate rigging trial in 2015 of former UBS trader Tom Hayes, saying he wanted "a message sent out to the world of banking". "Those convicted of manipulating interest rates will face substantial custodial sentences," he said. But, he added: "Part of the answer lies in a desire to help Barclays prosper, and perhaps it is something to do with the desire to be respected by others. Whatever the reasons, you have been convicted of being knowingly and dishonestly involved in this conspiracy." Carlo Palombo's lawyer John Hartley said Mr Palombo and his family were devastated by the outcome. "Mr Palombo started at Barclays as a junior trader and was taught by his management from an early stage about making requests of the submission desk," said Mr Hartley in a statement. "He gave evidence during the trial that this was an ordinary course of business at the bank and there was never an issue of any of his actions being dishonest at that time and that he had received no training on Euribor submissions. No senior members of management were on trial." In a BBC Panorama programme "The Big Bank Fix" in 2017, the BBC revealed a secret recording which implicated the Bank of England in a practice called "lowballing". Lowballing occurred during the 2008 financial crisis, when banks artificially lowered their estimates for Libor (the London Interbank Offered Rate) - the dollar and sterling equivalent of Euribor. Mr Hayes's case is now with the Criminal Cases Review Commission (CCRC) amid growing doubts about the safety of his conviction. The evidence against him also consisted of "trader requests" to put in higher or lower libor submissions. The trial of Palombo and Bermingham heard similar evidence from Helmut Konrad, a retired banker who helped set up Euribor in 1999, who told the court in 2018 it was "okay" for banks to submit a rate from a number of options that were equally good, even if one rate would be more profitable for the bank. At this year's trial, he told the court "as long as we're talking about the range of permissible rates, it's fine".